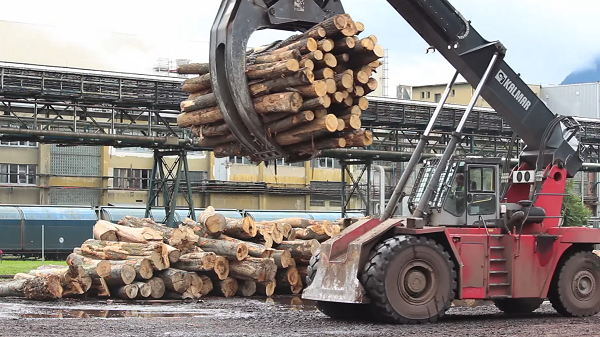 Capacity: handling of 2 millions of cubic meters of wood p.a. Slovwood serves transports and unloads tenths of trucks and wagons of timber in average on daily basis. It is a very challenging job to effectively plan and execute the logistics of timber from thousands of loading places. Unbalanced delivery of the material („empty“ time slots versus rush during peak times) leads to traffic collapses on the roads near the unloading point. These were main reasons why SLOVWOOD began to look for an information system to manage the whole supply chain. We have signed a contract to analyze and to implement the Wood Logistic System in June 2012 after a presentation of our Transport Logistic System that was already in use by another customer of ours. To manage delivery planning of the whole supply chain. To ensure consistency and reliability of data for all business partners. To have overview of all incoming vehicles + material and their arrival time slot for acceptance staff. To allow organizing electronic tenders for truck deliveries. On-line evaluation of contract fulfillment for individual suppliers. To process and on-line evaluate the GPS data from trucks. Communication with SAP in both directions. Communication with an Attendance system. Web client interface with user authentication. Wood suppliers may create transport request only if there is a capacity to process the material at the unloading point. Forwarders might reserve transport only within an free time slot based on the unloading capacity at the unloading point. Forwarder is capable to serve transport only from allowed loading places and his evaluation based on quality of service and price. The system also monitors and evaluates the actual transport performance based on GPS data from the GPS unit located in the forwarder's car. Material transport organized from the loading point directly in a forest or stock. Supplier and supply steering – material, quality and quantity. Weighting and delivery registration process done in system. Current process status information available on-line for all. System provides information on every subject in the whole supply chain, including a rating feature. The first version of the WLS was released into the production five months after the contract was signed. Any data change within WLS triggers an automatic recalculation of their dependencies. Clear and swift reporting of information needed for decision making and future planning.